These are the best luxury cars from Robb Report, a magazine for the ultra-wealthy consumer. Each year for the past 25 years, Robb Report Magazine has selected the very best products for the ultra-wealthy in its "Best of the Best" issue. This year, when it came to automobiles, the magazine looked at vehicles in six different categories, choosing the top cars for those for whom price is no object. 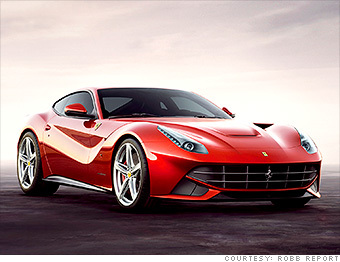 The Ferrari F12berlinetta garnered the Robb Report award among sports cars. Besides being a really impressive performance machine -- it can go from zero to 60 miles an hour in three seconds -- the F12berlinetta has 17.6 cubic feet of cargo space under its hatchback and is a pleasure to drive, even ordinary roads not just at the track. None of the other cars in the running for this category approached the Berlinetta's $316,000 price tag. The contenders were the Audi R8 V10 Plus, Nissan GT-R, Porsche 911 Carrera 4S and the SRT Viper.